Atrocyanea is an unusual salvia from Bolivia. It hasn’t been about much or for many years. 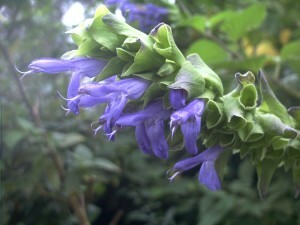 The flowers are blue in a congested head. Canes grow to 2m and are winter dormant. At first I was worried that it would be invasive because of its tubers but I don’t think it will be a problem. It grows in sun or part shade. Atrocyanea must come from the moist tropical areas of Bolivia as it likes regular water. It forms tubers from which it resprouts in spring. It also sets seed.